A month ago, I embarked on writing a short On This Day in History for February 9, 1825, the day the House of Representatives voted to elect Secretary of State John Quincy Adams president with the engineering of Speaker of the House and Kingmaker Henry Clay. Some topics, however, are impossible to write shortly and succinctly without being drawn in and carried away. As Pulitzer Prize-winning historian and doyen Robert Remini remarked in his abridged The Life of Andrew Jackson in 1987, “When I first undertook this project I had intended to write a complete life in one volume. But it did not work out that way. One volume grew to a second and a third, and I might have gone on to produce a fourth had my editor, not intervened in the nick of time.” (Remini, ix) When I first started this article, it was meant to be a modest 1,000–2,000 short essay that ballooned to over 16,000 words, which would be longer if I just kept on writing and did not know “when to fold them,” as another gambler Kenny Rogers so aptly put it. While the 1828 campaign that elected Jackson to the presidency is deemed the start of the Democratic revolution, 1824 is significant as the catalyst for the revolution, the decline of King Caucus nominations and the last campaign without political parties. At the center of the 1824 campaign was Speaker of the House Henry Clay, statesman, orator a magnetic larger than life figure, a gambler, who took a gamble and ruined his future presidential prospects. I first wrote about Clay in 2008, “On This Day in History… February 7, 1839, Henry Clay declares I had rather be right than president,” on the History News Network, which I expanded this year. Clay’s dreams of the presidency were not thwarted in 1839; they were in 1825 when rumors of a corrupt bargain over his support of Adams in the House vote. Those rumors popped up for the rest of his political career when he ran in 1832, attempted to garner the nomination in 1840, and when he was a nominee in 1844. I have previously examined the elections Clays ran when I contributed the overviews to the 2011 revised version History of American Presidential Elections, 1789–2008 edited Gil Troy, and originally edited by famed historians Arthur M. Schlesinger, and Fred L. Israel. However, I never looked at the 1824 election to this extent with its “colorful personalities,” as Remini called the candidates, its intrigues and corruption. Clay’s popularity among historians has been resurgent with four major publications by preeminent historians in the past decade with two books published in the past year alone adding to the most significant recent volume Remini’s 1991 book Henry Clay: Statesman for the Union. In 2010, David S. Heidler and Jeanne T. Heidler’s Henry Clay: The Essential American was published and in 2015 Harlow G. Unger’s Henry Clay: America’s Greatest Statesman. In 2018, Kentucky state historian James C. Klotter’s Henry Clay: The Man Who Would Be President was published, having a thesis that looks at Clay in a positive light and completely refutes any charge of a corrupt bargain. The most recent publication was by bestselling historian H. W. Brands Heirs of the Founders: The Epic Rivalry of Henry Clay, John Calhoun and Daniel Webster, the Second Generation of American Giants, also takes a positive view of Clay. Historians have since been trying to determine was there a corrupt bargain? Explicit or implied? Did it even matter when Washington was all-corrupt and dealing making was commonplace? At the center, is the question, when did Clay decide to support Adams? Did Clay decide as he claims to support Adams in October 1824 before leaving his Ashland plantation in Kentucky to return to Washington? Or did Clay make his decision in December 1824, while friend Robert Letcher scouted for Clay in a series of meetings with Adam? Or was it the most damning, on a cold January 9, 1825, evening, when Clay and Adams met and hammered out a deal where Clay promised his support and they discussed the “future,” Clay’s future? No matter what, it looked bad for Adams and Clay when on February 12; Adams offered Clay the Secretary of State post, the traditional stepping-stone to the presidency. Whether there was a deal or not, Jackson’s fury charged the two with complicity, because in his mind he could not imagine they had not made a deal to deny him the presidency. The charge led to a democratic revolution in 1828, the birth of the modern party-system, the Democratic Party, and an emphasis on direct voting by the public of electors giving the public more power to decide their president. The charge also led to the downfall of Adams’s presidency, as Jackson began his assault and 1828 campaign from the moment of Adams inauguration on March 4, 1825. The charge would forever haunt Clay’s political future. Clay wanted more than anything else in life to be president despite his later claims in 1839 that he “would rather be right than president.” The great compromiser Clay would be the first powerful Speaker of the House, Secretary of State, a US Senator, and a three-time presidential candidate but never president. On this day in history… March 7, 1825, President John Quincy Adams appoints Speaker of the House of Representatives Henry Clay as Secretary of State after Clay delivers presidency for Adams in House vote in what Jacksonians accused of being a corrupt bargain. In the 1824 election, after voters went to the polls from late October to early December none of the candidates received a majority of Electoral College votes. 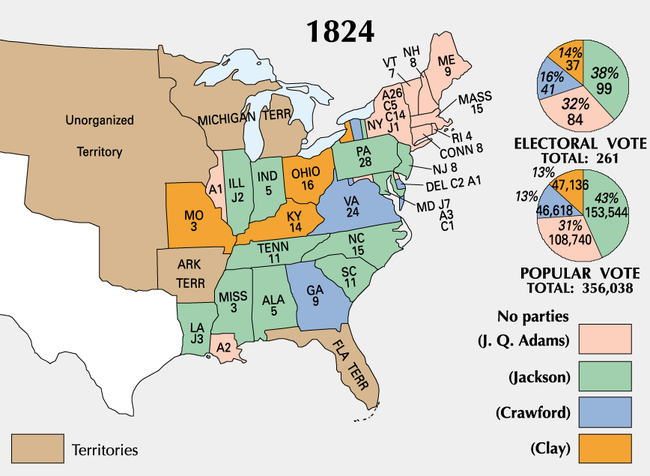 General Andrew Jackson led in the popular vote and had a plurality of the Electoral College votes but not a majority, Secretary of State Adams came in second and Secretary of Treasury William H. Crawford was in third, while Clay came in fourth. Under the 12th Amendment, the House of Representatives decided the election with the top three candidates. Jacksonians charged there was a “corrupt bargain” between Adams and Clay after Adams named Clay Secretary of State shortly after the House vote. Clay, a presidential candidate in 1824 failed to make the top three after candidate deal making denied him the coveted chance in the House vote, giving him the opportunity to serve as “president-maker.” (Klotter, 119) Although historians will never be certain of a corrupt bargain, Clay did meet with Adams on January 9, 1825, and agreed to throw support behind the Secretary of State from Massachusetts, however, Clay longed opposed General Jackson and what he perceived as abuses of power, and consistently claimed he decided on Adams as soon as his presidential chances collapsed. Clay chose to support Adams a month before the House vote based on their political compatibility, while support for Clay’s American System legislative program was paramount to his decision. On February 12, Adams offered Clay the position of Secretary of State, and three days after Adams’s inauguration on March 7, the Senate confirmed clay to the post with a vote of 17 to 10 proving how controversial the appointment was at the time. For the first time in a nation were six of the states still did not have direct voting for president the popular vote became an issue. As the Congressional Quarterly notes in Presidential Elections, 1789–2000 “The events of 1824 kindled the flame of popular democracy.” (CQ, 25) Jackson started a democratic revolution with his call of corruption, would lead into the 1828 election with the birth of the Democratic Party and his election triumph. However, deals and alliances were common in Washington politics and none of the candidates were above implied deals that would benefit their political ambitions and futures believing it was for a higher purpose the good of the country. The Baltimore Morning Chronicle newspaper attacked the nomination, writing, “The poor little political bird of ominous note and plumage, denominated a CAUCUS, was hatched at Washington on Saturday last… The sickly thing is to be fed, cherished, pampered for a week when it is fondly hoped it will be enabled to cry the name of Crawford, Crawford, Crawford.” (Boller, 33) In 1824, Crawford would suffer a relapse most likely another stroke making him a “living death,” with memory and speaking problems. Mostly the public knew nothing of Crawford’s health problems and stayed in the race. Klotter points out, “Even among the informed, not many knew exactly what had occurred.” (Klotter, 96) Soon, however, there were concerns about his actual health and that affected support for his candidacy. In Kentucky, Speaker of the House Henry Clay, the architect of the American System and the Missouri Compromise of 1820 was the local favorite. Although Clay had served as Speaker of the House, at that point no speaker had been considered for the presidency, however, as Heidler explains, “No Speaker before the Civil War would use effectively the precedents set by Clay to manage the House of Representatives or wield his level of influence over legislation and policy… Nobody doubted that Henry Clay was presidential timber.” (Heidler, 153) At first, Secretary of War John C. Calhoun tried for the presidency. Calhoun was Yale-educated and married his first cousin once removed, a wealthy, beautiful heiress, despite his success at only 41 years-old he not liked, he was considered “insincere and humorless.” (Heidler, 158) As Klotter notes, “Many political observers — perhaps including Calhoun himself — were not certain of what he was, what he believed, or what he sought.” (Klotter, 99) When he could not get support from his home state of South Carolina, he began his ultimately successful push for the Vice Presidency. Jackson had his deficiencies; he had a “bad temper” that was “made doubly dangerous by a touchy sense of personal honor.” (Heidler, 160) Heidler points out, “The American people did not care. That kind popularity sooner or later assumes its own dynamic and generates its own magnetism.” (Heidler, 160) Although an aristocrat, landowner, and businessman, Jackson was depicted as pro-democracy and sympathetic to the plight of the worker. (Klotter, 106) Jackson also became a symbol of democracy and universal suffrage and was able to appeal eastward to Pennsylvania. After Calhoun dropped out, Jackson was the beneficiary in the south of his support leaving in the cold. Soon Jackson rose to become the front-runner in the election. By January 1824, Crawford’s camp first asked Adams and then twice asked Clay to be the vice presidential nominee but he refused both times even though the pathway would bring him to the presidency. In October 1824, Clay told a friend in Ohio he was taking the high ground and was refusing any compromising in the campaign. Clay expressed, I have felt it my duty to abstain from every species of compromitment; to reject every overture looking to arrangements or compromises; and to preserve my perfect freedom of action, whether I am elected or not. Of one thing you and the rest of my friends may be perfectly assured, that if I am elected, I shall enter upon the office without one solitary promise or pledge to any man to redeem; and if I am not elected, I will at least preserve unsullied that public integrity and those principles which my friends have supposed me to possess.” (Klotter, 113, Hammond, 37) The irony that but three months later Clay would be accused of a corrupt bargain with Adams in his role as House speaker and election decision maker. Clay would declare his high moral principles as long as he believed he had the chance to become president because he thought he was the best candidate to serve in the role. Clay could have garnered the support in New York he needed by adding former Senator and New York Governor DeWitt Clinton to his ticket and would have gained an edge in the fight against Martin Van Buren and “The Bucktails,” known as the “Albany Regency.” Clay responded, “I can make no promises of office, of any sort, whatever. Whatever support shall be given by me, if any must be spontaneous and unbought.” (Heidler, 171) Instead, Clay took New York Senator Nathan Sanford for his running mate and Clinton’s supporters backed Adams. Van Buren misunderstood Clay semi refusal enough to dump Albert Gallatin from Crawford’s ticket, giving the presumption Clay would take the vice presidential slot, which hurt him in the fall 1824 voting. With New York’s vote, Crawford was in third place and Clay pushed to fourth and out of the running in the House. Weed wanted New York and wanted Crawford in the House vote because Adams would have the advantage. As Heidler points out, Weed “having accomplished his objective, had blithely cast off the Kentuckian… Clay’s people had been simply bamboozled.” (Heidler, 174) Virginia, but the legislature voted for Crawford, and in Louisiana, where Clay had the support he lost the votes based on rumors. In Indiana, Illinois, and Ohio, rumors that Clay joined Crawford’s ticket, or was deathly sick or dropped out of the race helped Jackson. The rumors that Clay was dropping out of the race commenced as early as March 1824 and were in overdrive by September and October. With the rumors, Clay supporters looked to other candidates. Clay lacked a supportive newspaper in the east, those papers were the source of many of the rumors including a Massachusetts paper that published a story right before the election that Clay wanted the vice presidency, other just claimed he withdrew, and he had no voice to counter the accusations in the area. (Klotter, 114) Louisiana was Clay’s last hope, in 1823, the legislative caucus went for Clay and in 1824; he received the assurances of Governor Thomas B. Robertson and then the governor-elect. The same rumors plagued Clay in Louisiana and a possible Adams and Jackson agreement ended Clay’s chances to be thrown into the House vote. Historian Robert Remini believes that the Jackson men and Adams men made a deal to lock Clay out of Louisiana where he would have surely won the votes. (Remini, 82) A week before Christmas, Louisiana’s vote came in, Jackson received three votes and Adams received two in Louisiana. As early as October 1824, Clay was spouting about his potential support for Adams, even before he returned to Washington for the Congressional session. According to Klotter, there were a half a dozen men that claimed in writing that Clay told them either he would not support Jackson in the vote or would support Adams. Among the witnesses, “included a Kentucky congressman, a respected doctor, Thomas Hart Benton, and the almost irreproachable John J. Crittenden.” (Klotter, 124) After Clay returned to Washington he told a host of others about his intentions including “Lafayette, a Virginia Senator, and a Louisiana lawmaker.” (Klotter, 124) Before Clay informed Adams about his support, Clay already told his confident Francis Preston Blair on January 8, 1825. (Klotter, 125) Clay made his intentions clear long before official word trickled out about Clay’s support. Both Jackson and Crawford camps “feigned” shock which Klotter called a “political tactic,” since they heard about Clay’s intentions although they might have believed Clay might change his mind. When Jackson’s camp heard about Clay’s “politicking,” they figured he was backing Adams. Jackson was suspicious of Clay and Adams and even Crawford were working against his election before Clay’s meeting with Adams pledging support. The Jackson camp went about to try to counter Clay. Two weeks later Clay heard the Kentucky legislature informed the state delegation to vote for Jackson, which was “a heavy blow for Clay.” (Klotter, 126) Clay in swift maneuvers brokered an agreement, advising the congressmen to vote based on the will of people and their vote rather than on the instruction of the appointed senators and to vote their conscience “as their final guide.” (Klotter, 126) Letcher also assured the Kentuckians that Adams promised recognition to the state and possibly Clay. On January 24, the Kentucky state delegation announced they would support Adams, although Adams did not receive a single vote in the state. As the speaker, Clay took the brunt of the criticism for supporting Adams and swaying the House vote but he was not the only one in Congress engineering and politicking for Adams. Daniel Webster worked for Adams and securing Federalist interests in the next administration. Adams promised Webster not to “purge” the Federalists, and Webster used that to woo the Maryland delegation to vote for Adams rather than Jackson. Clay worked to use his influence on the Missouri and Louisiana delegation, while Adams did his own political maneuvering to convince his friend Daniel Pope Cook to have the Illinois delegation vote for him rather than Jackson. After Clay announced his support, it was “like a thunderclap” and “all kinds of political hell broke loose.” (Remini, 89, Klotter, 126) The newspapers around the country and especially in the south and west criticized and vilified Clay’s support of Adams over westerner Jackson while in the north they defended his support of native son Adams. Robert Y. Hayne of South Carolina remarked, “We are all in commotion about the monstrous union between Clay & Adams, for the purpose of depriving Jackson of the votes of the Western states where nine-tenths of the people are decidedly in his favor.” (Remini, 89) Hayne was not the only calling it a monstrous union or coalition as it was more politely referred. Senator Martin Van Buren was “outraged” and he told a Kentucky Congressman, “in voting for Adams, ‘you sign Mr. Clay’s political death warrant.’” (Unger, 239) Clay was convincing the Western states that supported Jackson to abandon their popular vote in entirety and vote in the house for Adams. Remini called it “theft, pure and simple… Could they not see this? It would strike everyone as a “deal”; it would confirm every suspicion of intrigue; it would prove that corrupt politicians in Washington were not above denying the people’s right to determine the chief magistrate.” (Remini, 89) Clay was committing political suicide. As the Jackson and Crawford camps raged and accused Clay and Adams of a bargain, the men from both candidates tried to engineer a similar arrangement to have their candidate win. As Kotter recounts, “While Jackson’s political handlers had been pretty much the same thing as had the other camps — probing alliances, seeking deals, arranging for votes — Andrew Jackson remained either ignorant of those actions or, more likely, had chosen to interpret them in a different light than more neutral observers would.” (Klotter, 127) Jackson’s men attempted to convince Jackson to align politically with Crawford to gain enough votes to win. Radical, Samuel Swartwout of New York engineered the attempted “reconciliation.” Jackson’s wife Rachel even visited Mrs. Crawford as an overture for rapprochement. Buchanan’s description and Jackson’s misunderstanding fueled the rumors of a corrupt bargain. As Klotter recounted, “Jackson apparently heard what he expected to hear, not what Buchanan actually told him. It confirmed his conspiracy theories that his enemies sought to thwart the will of the people.” (Klotter, 128) Buchanan never told Jackson Clay asked for the cabinet post only that he offered it. Jackson, however, refused to believe that timeline of events based on his long dislike of Clay, he assumed the Speaker came to barter votes for a cabinet post and when Buchanan refused, Clay made the agreement with Adams. However, Jackson later admitted Buchanan “never gave any exonerating testimony in their [sic] favor.” (Klotter, 129) Jackson saw the Kentucky delegation’s decision to support Adams as proof of a bargain between Clay and Adams and sought to punish and embarrass the two political parties hoping to discredit the political reputation, with the goal that the House would go and vote based on the election’s popular vote. Adams may have not generally objected to making deals as a candidate and remained vague in his diary about his meeting with Clay and the Jacksonians attacked Clay for supporting Adams in the House crying corruption, Clay insisted of his honesty and denied knowing about Adams’s potential choices for his cabinet. Before the House vote, Clay firmly writes in letters to Francis P. Blair about his honesty and not knowing whom Adams intends to install in his cabinet. On January 29, 1825, Clay wrote Blair, “The friends of — have turned upon me, and with the most amiable unanimity agree to vituperate me…. The knaves can not comprehend how a man can be honest. They can not conceive that I should have solemnly interrogated my conscience and asked it to tell me seriously what I ought to do.” (Clay, 108) On February 4, 1825, Clay went further when asking Blair about the Cabinet, showing he did not barter a cabinet post for his support of Adams. Clay wrote, “I observe what you kindly tell me about the future Cabinet. My dear sir, I want no office. When have I shown avidity for office? If Mr. Adams is elected, I know not who will be his Cabinet. I know not whether I shall be offered a place in it or not. If there should be an offer, I shall decide upon it… according to my sense of duty…” Clay’s repeated claims of ignorance would not be enough to ward off the onslaught of charges. On February 9, 1825, at noon, in a joint session of Congress, the Senate and the House counted the Electoral College votes. There was a snowstorm but still, Americans came to witness history including “foreign ambassadors, governors, judges and distinguished persons.” (Remini, 92) After they counted the votes, the president of Senate pro tem John Gaillard declared Calhoun elected as Vice President and announced that since none of the candidates received a majority of the Electoral College votes, the House has to vote to determine who would be president from the top three candidates. After two hours of ballot counting, the senators left for the House to conduct their historic vote. Speaker Clay took roll call as the representatives sat with their state delegations positioned from North to South. The House with all its representatives present except for one from Virginia proceeded to vote. Each state had a box to put their ballots and a representative bought to Daniel Webster and John Randolph who were to count the votes from the twenty-four boxes. Thirteen states were needed for a candidate to be elected. Nobody in the House thought they would reach the majority for any candidate on the first ballot though they did believe Adams would lead with twelve states. Unlike the Electoral College were the number of votes depended on the population, in the House vote each state only had one vote making them all of equal value. At first, Jackson did show he was bitter about his loss, at the reception in Adams honor he “bowed” and “extended his hand” to Adams to “congratulate” him on his victory. (Heidler, 184) Jackson and his camp were livid at Clay’s maneuvering with the vote garnering Adams six more states than he won, Kentucky, Missouri, and Ohio, which went to Clay in the general election and three of Jackson’s Maryland, Louisiana, and Illinois. Fueling Jackson’s cries of corruption was Adams offer and Clay’s acceptance to the Secretary of State post. Clay received both solicited and unsolicited advice after the offer became public which was divided between accepting and refusing the post. Some thought it would be better if Clay refused, it would be the best way to refute the accusation. In a letter to Francis Brooke, Clay wrote, “Conscious of my own purity of intentions, I ought not to give weight of a feather to Mr. Kremer’s affair.” (Brands) In the end, Clay decided to accept the post feeling a refusal would only fuel the rumors and he could not let the Jacksonians win. Clay determined “they would abuse me at any rate.” As Heidler indicate, Clay decided, “He would not be intimated by idle gossip.” (Heidler, 184) Clay notified Adams he would accept the nomination for Secretary of State. Their criticism was two-pronged they accused Adams and Clay of creating a dynasty calling them “the upholders of corruption and the enemies freedom.” The Jacksonians also reminded the public that Adams and Clay went against the popular vote and “will of the people, and deprived the electorate of their rightful choice for president.” (Klotter, 135) They pointed out that Jackson won 41 percent of the popular vote, while Adams had 31 percent, Clay 13 percent, and Crawford 11 percent. As Klotter indicates Adams and Clay combined had more Electoral College and popular vote percentage than Jackson. Clay did not think much of the accusation, “noting that if the people’s will was that Jackson to be president, they would have voted him into office outright.” (Klotter, 135) At a time when six states had their legislatures vote for the electors, there was no real popular vote. Recently, historians’ viewpoint on whether there was a corrupt bargain differed depending on if they were writing a biography on Andrew Jackson or Henry Clay; these historians were more sympathetic to their subject side on the issue. Historians have questioned more whether there had been a corrupt bargain or just an understanding between Adams and Clay in order to defeat Jackson. Jackson historian Robert Remini is the most skeptical about the long-held belief there was no bargain. In his 1989 biography, Henry Clay: Statesman for the Union Remini left a door open to the possibility, writing, “Was there a corrupt bargain between Clay and Adams? Probably not, although absolute proof does not exist and most likely never will.” (Remini, 270) Remini in his 1981 book, Andrew Jackson: The Course of American Freedom, 1822–1832 made a bold assumption, he went as far to argue that Adams and Clay did not need to make an actual bargain because their action implied they made an agreement. Remini wrote, “Nothing crude or vulgar, like declaring the terms of a political deal, passed their lips. No need. Both men understood one another’s purposes. Both men knew what was expected of them when their conversation about the past and future ended. Surely they both realized that in exchange for House support Adams would designate Clay as his secretary of state.” (Remini, 89) Remini is probably the only historian to go so far in his accusation. 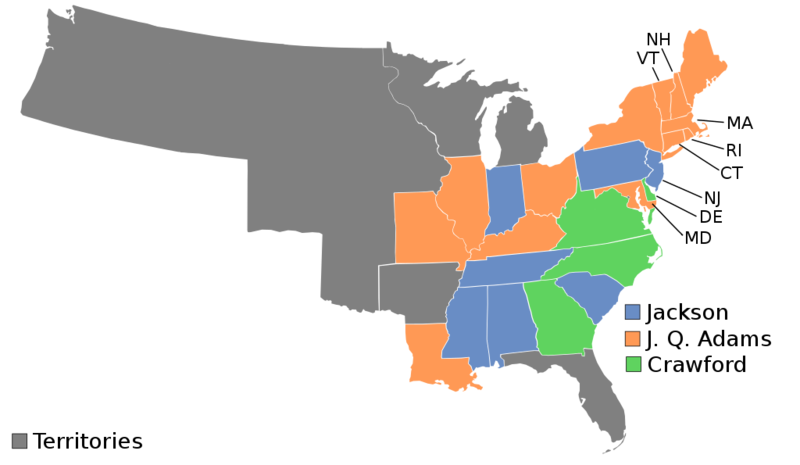 Presidential Elections, 1789–2000. Washington, D.C: Congressional Quarterly, 2002. Adams, John Q, and Charles F. Adams. Memoirs of John Quincy Adams: Comprising Portions of His Diary from 1795 to 1848. Philadelphia: J.B. Lippincott & Co, 1970. Brands, H W. Heirs of the Founders: The Epic Rivalry of Henry Clay, John Calhoun and Daniel Webster, the Second Generation of American Giants. New York: Doubleday, a division of Penguin Random House LLC, 2018. Clay, Henry, and James F. Hopkins. The Papers of Henry Clay: Vol. 4. Lexington: University of Kentucky Press, 1972. Clay, Henry. Life and Speeches of the Hon. Henry Clay. Volume 1 of 2. Place of publication not identified: Gale, Sabin Americana, 2012. Heidler, David S, and Jeanne T. Heidler. Henry Clay: The Essential American. New York: Random House, 2010. Heiskell, Samuel G. Andrew Jackson and Early Tennessee History. Nashville, Tenn: Ambrose Print. Co, 1918. Howe, Daniel W. What Hath God Wrought: The Transformation of America, 1815–1848. New York: Oxford University Press, 2007. Klotter, James C. Henry Clay: The Man Who Would Be President. New York, NY: Oxford University Press, 2018. Remini, Robert V. Andrew Jackson and the Course of American Freedom, 1822–1832, Vol. Ii. New York: Harper & Row, 1981. Ratcliffe, Donald J. 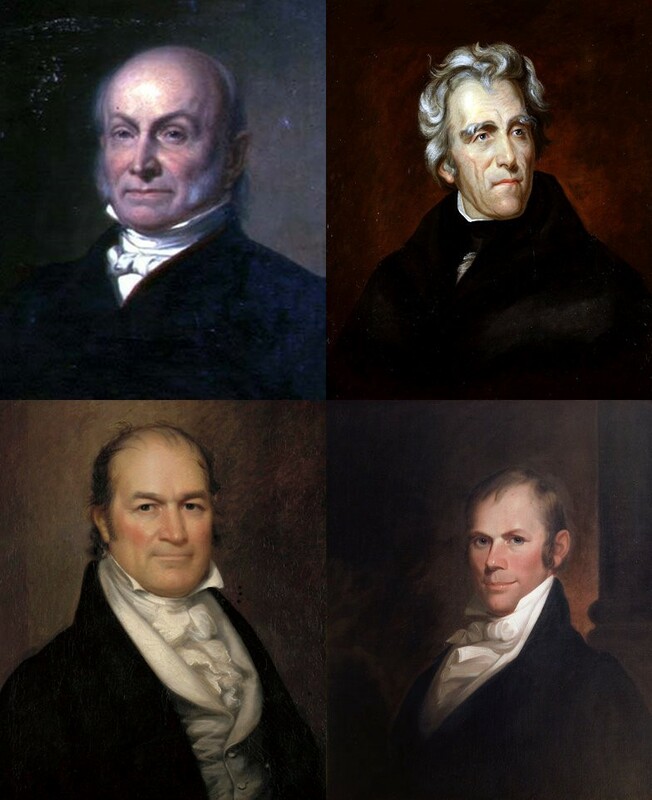 The One-Party Presidential Contest: Adams, Jackson, and 1824’s Five-Horse Race. Lawrence, Kansas: University Press of Kansas, 2015. Remini, Robert V. Henry Clay: Statesman for the Union. New York: W.W. Norton, 1991. Remini, Robert V. Andrew Jackson: The Life of Andrew Jackson. Newtown, CT: American Political Biography Press, 2008. Seager, Robert. “Henry Clay and the Politics of Compromise and Non-Compromise.” The Register of the Kentucky Historical Society, vol. 85, no. 1, 1987, pp. 1–28. JSTOR, www.jstor.org/stable/23380816. Traub, James. John Quincy Adams: Militant Spirit. New York: Basic Books, a member of the Perseus Books Group, 2016. Unger, Harlow G. Henry Clay: America’s Greatest Statesman. New York: Da Capo Press, 2015. Unger, Harlow G. John Quincy Adams. Boston, MA: Da Capo Press, 2013. Wilentz, Sean. The Rise of American Democracy: Jefferson to Lincoln. New York: W.W. Norton, 2006. Bonnie K. Goodman has a BA and MLIS from McGill University and has done graduate work in Judaic Studies at Concordia University. She is the author of “Silver Boom! The Rise and Decline of Leadville, Colorado as the United States Silver Capital, 1860–1896,”and contributed the overviews and chronologies to the “History of American Presidential Elections, 1789–2008,” edited by Gil Troy, Arthur M. Schlesinger, and Fred L. Israel (2012). She is a journalist, librarian and historian and a former Features Editor at the History News Network and reporter at Examiner.com where she covered politics, universities, religion, and news. She has a dozen years of experience in education and political journalism.